Onkyo has carved out a significant niche in creating high quality yet competitively priced mobile phone friendly audio systems. The latest to emerge from its stable is the CS-255DAB hi-fi mini system which the company claims offers high quality audio in a stylish package, and judging by the pics it isnt wrong on the latter. As well as featuring Apple-certified charging connections for new (Lightning charging dock for iPhone 5, iPod touch (5G), and iPod nano (7G)) and legacy iPhone/iPod models, the CS-255DAB also sports a USB connection to enable audio playback from compatible smartphones/tablets via USB. Other features include an integrated CD player, DAB/DAB+ tuner with 40 memory presets and a 30 preset FM tuner. 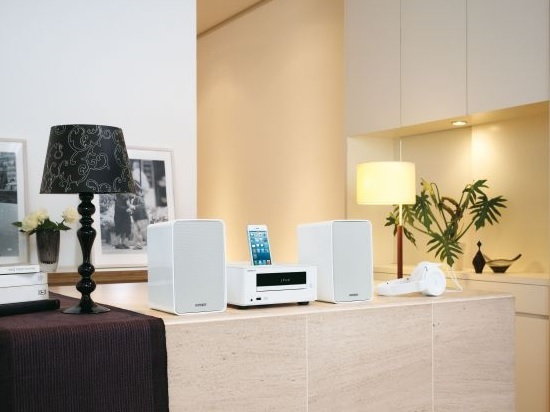 The CS-255DAB is powered by an energy-efficient digital amplifier and is supplied with robust two-way speakers. The cabinets feature a 10cm cone driver, 2cm balanced-dome tweeter, and a cabinet with non-parallel sides with rolled edges to prevent internal standing waves. Onkyo claims that even at higher volumes, this compact mini system maintains excellent composure, with an airy, pleasant mid-range and punchy bass response. It retails for £249.99 and will be available in July.